There’s no special styling going on in this picture, no special Photoshop effects. It’s just a simple shot that I took while I was experimenting with mirror water and I thought I’d share. I’ve seen some great pictures on Flickr from talented residents using this mirror water effect and I thought I’d try it out. A friend directed me to this site where Zonja Capalini gives a very simple guide on how to create the effect in world. I didn’t exactly try hard to put this look together, since both the mesh top and skirt are from Tres Blah at July’s C88 and it’s pretty obvious how well they go together, it’s really a no brainer. But I love the fact that they were sold separately rather than as one piece because they are so perfect to mix and match with other items as well. This hair is one of the new releases from Elikatira at Hair Fair. You can find them located on the Sand sim and here’s the direct SLURL. I have said many times that I love the mesh hair from Elikatira and this simple style is no different. I love the textures and the fact that I can buy an essentials pack of several different colours for little more than the cost of a normal colour package, and for me, I think that the rigging is some of the best for hair on the grid. Also ❤ the mesh flip flop add ones from SLink! I’ve been waiting a couple of months for someone to release these and I’m so glad they’re here. I love the fact that they are add ons too, so you don’t have to pay a large sum of money just because they come with mesh feet. They also come in men’s sizes which is great because as we know the guys are not as well catered for as women in the fashion department. Just a short and sweet post today, hope you’re all enjoying your week! Guess what I did today? Shopping! Just to add a little bit more clutter to that ever growing inventory. I’ve been getting lots of tips though so thanks for those, I’ll get round to doing something soon I’m sure! This is a new release hair from Lamb at Hair Fari, which you can find located on the Flower sim, and here’s the SLURL. As you’ve probably noticed from my posts, I don’t usually change my hair colour, instead just wearing different shades of brown and I think that comes down to the continuity I kept for my role play character over all those years in SL. However! When I buy Lamb hair, I usually go for the ombre shades as it makes a nice change, but when I was trying this hair demo on and I accidently clicked the Milk colour demo, I decided that I actually really liked it. I umm’d and ahh’d over it the last couple of days because I wasn’t sure if I’d ever wear it, but when I started putting this outfit together this morning, I knew it’d be perfect. I love this new mesh tank from Toki Doki. It’s out for the new round of Stumblebum and comes in a huge range of colours. It really is versatile and you could wear it with pretty much anything. I didn’t want to go down the jeans and tank route today but with the textures and detail on the back (which you can’t see here but go try the demo coz it’s cute) it’s so easy to glam up as well. Also, check out my sunglasses! You can pick these up from Amarelo Manga at the One Voice event which is still on for a few more days. If you liked D!va’s Vivienne hairstyle then make sure you get over to Hair Fair and check out Vivienne Type B! It’s a slightly different version of the original, with thicker bangs but still the lovely fly away textures that D!va uses. You can find them located on the Flower sim and here’s the direct SLURL. This is my LOTD, I’m not really showing anything new. I’ve worn this lace top from Chemistry about 100 times and I don’t think I can keep repeating myself about how much I love it (well there you go, I did anyway) but it’s the first time I blogged the cropped version so I’ll give myself a pass on that. Looky looky, it’s another hair fair release! This time it’s from Epoque which is located on the Water sim, here’s the direct SLURL. I love this classic style and the bangs are a great length, I tend not to be a massive fan of ones that cover my eyes and usually end up modding the hair if it does, but this one’s perfect. This outfit is also great for anyone who is feeling thrifty after spending all those Ls at Hair Fair. The skirt and top are from House of Fox which I got last week for 50L Friday. The top is mesh and the skirt has system layer pants with a mesh insert, so it fits nicely. The skin is by Glam Affair, part of their Roza line which they have been selling a few versions of lately at TDR and C88. This one is available at the new round of TDR and is only 70Ls! Also the earrings and ring are from Kunglers at TDR Blue for only 70Ls and there is a necklace to match at the Kunglers main store. TDR Blue changes rounds in few days so make sure you get over there if you want to snag this set for cheap! I’m not sure if you can see my nails very well in this picture but they are mesh and from Leverocci. I don’t usually wear prim or any kind of nails, but recently I had started looking at some that I might try out. Then I saw these at Leverocci’s anniversary sale for 30Ls and I couldn’t pass them up. The length is nice and natural and they come in a huge array of colours, either plain polish or a french manicure style. I bought several styles and now I don’t take them off, so they’re definitely worth trying out if like me you were unsure of prim/mesh nails. This is my LOTD and another new release from Hair Fair! This one is from Exile and again it’s mesh but with these decorative feathers as an optional attachment to wear with it. As usual I’m doing my ❤ thing for the natural looks. Here’s a direct SLURL to Exile at the fair which is located on the Sand sim. Also new in this picture is the sweater from Toki Doki. It’s so comfortable looking with it’s chunky knit texture and is the perfect type of sweater that I’d just want to curl up in of an evening. Hope you enjoy my little festival-goer look and are counting the hours till Hair Fair officially opens! Don’t forget to join the demo update group in world as well as the Flickr group! In case you were unaware (yea, I know, bad joke) Hair Fair 2012 opens tomorrow! There are 4 full sims for hair addicts to get their fill, with designers from across the grid coming together to showcase their latest releases and to help raise money for Wigs For Kids. When you get to the fair make sure you pick up the folder at the entrance, containing a map of the sims as well as a notecard for each sim with direct landmarks to each designers stall at the fair. This is a new mesh release you’ll find from Clawtooth, I’m a complete sucker for anything with a braid in it and the natural, loose style at the front is perfect for casual looks that I like to wear. You’ll find Clawtooth on the “Sand” sim and this is the direct SLURL. Also make sure that you join the Hair Fair Flickr group to show off your beautiful pics! 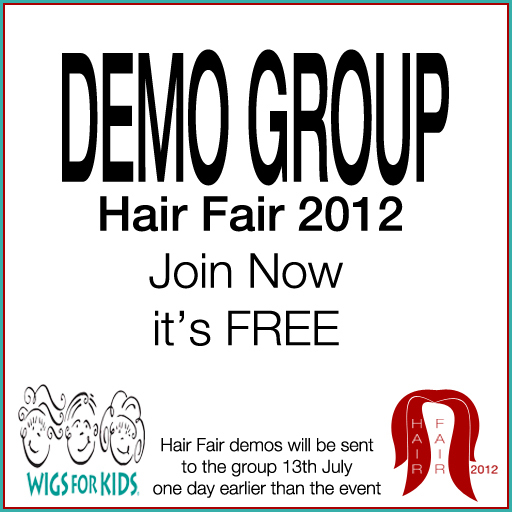 This is just a quickie to let you know about the Hair Fair Demo Group! Hair demos will be sent out to the group the day before the fair opens, it’s free to join and gives you the chance to organise your shopping trip by trying on the demos early! into your local chat in world and click the link in history. It’s well worth doing if you want to save time and have to fight less of the lag over the first couple of days.